This week's tech. is beamed live to you from the glittering lights of Las Vegas - where the world's biggest tech show, CES, has conjured up its normal mix of the iterative, the innovative and the downright bizarre. 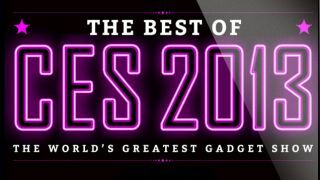 The iPad magazine will delve into 10 hidden gems from the show looking beyond the glossy televisions and big names to dig out some of those hiding their lights under a tech bushel. But, inevitably it is the likes of Sony, Samsung and Panasonic that have picked up the headlines, and there will be the first impressions of the latest flagship TVs and the impressive-looking Xperia Z. Tech. editor Marc Chacksfield - bleary eyed and furry tongued from the, ahem, networking told us that the issue would provide everything you need to know about this year's CES. "There's so much going on," he croaked, "And we are aiming to bring the very best to the magazine and make sure you stay up to date with the most important announcements." Also featured is the newly announced Project Shield from Nvidia going head-to-head with Kickstarter-sweetheart Ouya and a look at how Android has stepped beyond its mobile roots, and into our living rooms. You can grab the latest tech. issue now, or take advantage of the chance to subscribe and get five issues free.